Deliver magnificent excitement with this bouquet of long stem lavender roses arranged in an elegantly sculpted lavender glass vase. Guaranteed to impress! 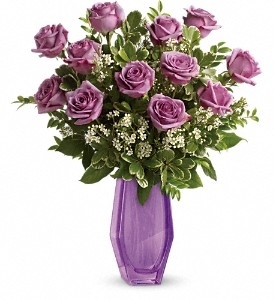 Long stem lavender roses and white waxflower are accented with assorted greenery.